This another Epipactis species that hardly seems to open its flowers fully, and this feature combined with its shady habitat makes it very difficult to spot. With an overall colour of dull green, rusty red or yellowish brown this is an inconspicuous and difficult to spot plant. It grows to a maximum of 55cm in height and all parts of the plant appear to be downy or hairy including the flowers. It has up to 12 leaves which sheath the stem and narrower bracts among the flowers. The inflorescence is lax and carries up to 30 small flowers which, if they open fully, are revealed as being pale green with a white lip. The hypochile is dark green and glossy and the epichile is pale greenish-white with very distinct white bosses. 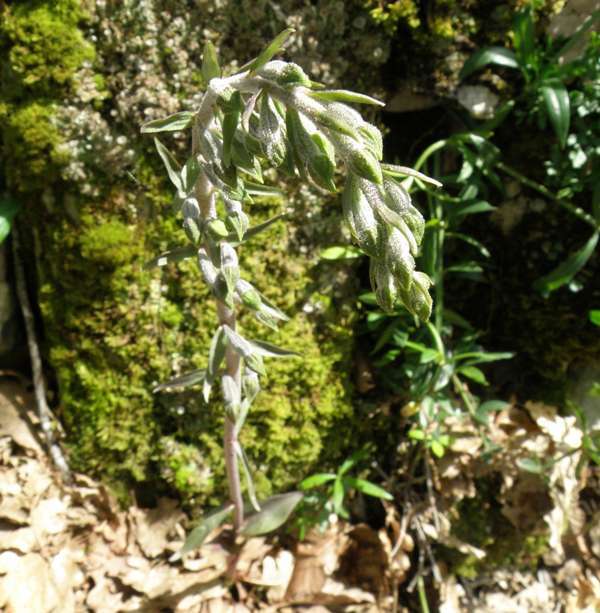 Although predominantly a Mediterranean mountain plant it is also found in coastal and lowland habitats. Its territory extends east from the Mediterranean into parts of central Europe and as far north as southern parts of France. Epipactis microphylla grows in dark forest settings, often under Beech or Hazel trees. This orchid can flower at any time between April and the end of July. The specimen on this page was photographed in the Lot Valley in France in late May.